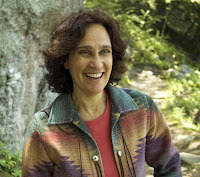 Joining us today is Susanna Reich, award-winning author of the magnificent PAINTING THE WILD FRONTIER: THE ART AND ADVENTURES OF GEORGE CATLIN (Clarion), a book that reminded me why I loved well-told biographies as a child and still do. Susanna's story has the power to make a chunk of American history absolutely unforgettable. "A great introduction to Catlin's work and an excellent title to use in social studies, history, and art classes," said ALA's Booklist in a starred review. School Library Journal agreed, giving the book another big star: "This is an excellent choice for libraries looking for good biographies, either for reports or pleasure reading." I asked the author some tough questions about writing and painting as an "outsider," and about the limits and possibilities of biography. She answered thoughtfully, as is her wont, and I've bolded a few phrases that I especially mulled over, so once again, emphasis mine. Pour yourself a hot cup of something, enjoy the conversation, and feel free to leave a comment at the end. Since you're on the Fire Escape, could you tell us about any past experiences of feeling like an outsider or living between cultures? Adolescence itself may be the ultimate outsider experience. It’s such a time of alienation—alienation from yourself because your body is changing, alienation from your parents as you struggle to establish your independence, and alienation from your peers, because there’s always some clique you’re not a part of. There’s always that conflict between wanting to be special and unique, and wanting to be part of the group. I think if we, as adults, can remember what it feels like to be a teenager, we’ll always understand what it means to be an outsider. In a way, every aspect of one’s identity, everything that makes you part of a group, automatically makes you an outsider to some other group. One’s ethnic, racial, or religious identity is only part of the story. As a white, college-educated, Jewish wife and mother who lives in the Hudson Valley, writes children’s books, and enjoys cooking, swimming, and hiking, I fit into many categories and groups that help define who I am. When you identify yourself as an outsider, there’s an implicit assumption about who’s on the inside. Who has the economic, political, military, or social power? In our country, the ultimate “insider” has always been the white, male, Protestant landowner. George Catlin fit that profile except that he didn’t have land or money, and that lack drove many of his choices in life. The indigenous peoples he painted didn’t fit into any of those categories. 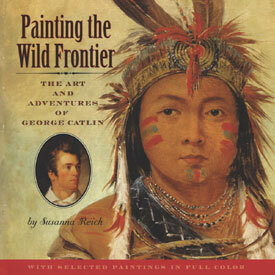 In the foreword to PAINTING THE WILD FRONTIER, you describe Catlin as providing an "informed outsider's viewpoint," and tells us that "he clearly worked hard to express it with a high degree of integrity." Is there a lesson from Catlin's life for modern-day artists and writers striving for integrity as WE tell stories from an "informed outsider's viewpoint?" The key is to look for common ground. Catlin wrote that he realized at an early age that Native Americans were human beings. That may seem ridiculously obvious to white people now, but it wasn’t necessarily obvious then. In his travels among the Indians, he had to establish some level of trust so that native peoples would let him paint their portraits. His paintings and writings depicted the unique culture of each tribe he visited, yet in his books and lectures he also repeatedly pointed out the similarities between whites and Indians. He walked a fine line between describing cultural differences and stressing a common humanity. Catlin started by painting Indians according to the prevailing sentiment at the time, that these were untouched "noble savages." He chose to romanticize them, at least for a while, to gain an audience for his paintings. In other words, he was caving into the realities of the market. Do you notice any compromises that children's book writers and artists might be making today when it comes to the realities of the market? Artists and writers who want to sell their work have to keep one eye on the realities of the marketplace and at the same time try to remain true to their artistic vision. It’s the rare person who writes or paints whatever they please, and then finds that’s exactly what the market is looking for. As far as making compromises, I can only speak for myself. Every artist or writer has complex motivations for doing what they do, and for choosing certain subjects, genres, or styles. We all have needs and desires. Most people want to be successful, though each of us has a different definition of success--as some combination of money, fame, notoriety, appreciation, admiration, respect, or love. Unfortunately, we have no control over whether our work will bring us any of these things. And when we don’t get what we’re looking for, it can hurt. We submit a book to an editor, and it gets rejected. Or the book gets published, but doesn’t get the reviews or the sales we were hoping for. So as artists and writers, it helps to concentrate on the work itself. It helps to have some psychological distance, to look at our work as objectively as possible and to separate our personal needs from the demands of the marketplace. In your author's note, you tell us that, "While writing this book, I discovered prejudices I didn't know I had, often based on romantic notions of American Indians that I learned from depictions in popular culture. Sometimes I found myself going back over what I had written and occasionally changing it to reflect a newfound awareness of the Indian point of view." Could you give us an example of a change you made to the text as you edited it with this heightened awareness? Prejudice is based on stereotypes, and stereotypes arise from a lack of knowledge and familiarity. As I read about, met, and spoke with American Indians, the stereotypes in my head began to dissolve. I had written a caption for an image that showed whites and Indians fighting. It said, "Many settlers were killed in the battle." All of a sudden, I found myself looking at this picture through Indian eyes and realizing that my caption took an implicitly white point of view. How would an Indian child feel reading that caption? What about the Indians who were killed? So I changed it to, "Many people were killed in the battle." That one-word change made the story more inclusive. When considering heroic artists and writers in the past, how do you study their lives without using twenty-first century eyes to judge their choices -- i.e., when I read about Catlin basically dumping his daughters without a letter for NINE YEARS in pursuit of art, my spirit recoiled, but would that have been more "morally acceptable" back then if the girls were living happily as teens with a governess and he was providing for them? Yes, of course, it’s shocking that he didn’t write to his daughters. And it’s easy to think of him as a terrible person for abandoning them (at least psychologically—after all, he did make arrangements for their care.) But given his inability to support them, and the very distinct roles of men and women at the time, they probably were better off living with their aunt and uncle in New Jersey. This arrangement not only provided for their physical needs, but also allowed the aunt and uncle to give them a more normal family life. We can only guess how Catlin’s daughters felt about this. So far, the historical record only tells the story from his point of view. By the 1850’s, the stresses in Catlin’s life had taken a severe psychological toll. As I wrote about this period in his life, I wondered about his mental state. What 58-year-old man in his right mind would abandon everything to go off to the South American jungle in pursuit of a lost gold mine? Catlin’s artistic vision had been a driving force in his life from the time he was a young man, and his financial aspirations were inextricably bound to his art. During the last twenty years of his life, he became completely obsessed. His actions may even make him less appealing as a moral example. But this isn’t a novel, it’s a biography. I couldn’t change the end of the story to make the main character more palatable. All I could do was tell the story as clearly as possible, in hopes that the reader would come away with a nuanced understanding and appreciation of George Catlin. If the main consideration for choosing a biographical subject for a children’s book was moral worth, there wouldn’t be very many biographies for children. By presenting Catlin as a complex person, I hope that young readers will be challenged to think about his behavior and question his decisions. After all, that’s what they need to do for themselves in order to become responsible adults. Essentially, a biographer is always an "informed outsider," and you do it so well, with so much integrity. What are a few tips you could give to a biographer-wannabe about portraying another person's life, especially when crossing ethnic and cultural boundaries (as you did in this book as well as with your biography about José Limón)? As a biographer, I try to get to know my subject as deeply as possible. It takes a lot of time, and it certainly helps if you love doing research, as I do. When I was researching Catlin and Limón, for example, I didn’t just read books by and about them. I also did a lot of tangential reading to help me understand the historical context. With Limón, I read about Mexican history and culture, as well as the history of modern dance going back to Isadora Duncan and Ruth St. Denis. For Catlin, I studied 19th-century portrait, landscape, and genre painting, the history of art patronage, and the evolution of 18th- and 19th-century esthetic philosophies. I researched Native American cultures and the settlement of the West, as well as the interaction of Europeans and indigenous peoples in South America and the principles of anthropology. And those are just a few examples of where my books took me. But there’s something else, something beyond the call to do thorough research. It has to do with using one’s self in the creative process. No two books on Jose Limón or George Catlin are alike, because each biographer’s personality and life experiences are different. Each of us sees and interprets the subject from a unique angle. My training as a professional dancer and my family’s stories about immigration helped me understand Limón. My knowledge of art history and my experience of what it means to live the life of an artist helped me understand Catlin. When it comes to crossing ethnic and cultural boundaries, every time we communicate -- whether by speaking, writing, painting, singing, or dancing -- we’re crossing a boundary between one human being and another. Sometimes, in order to share what we want to say, we just have to reach out a little bit further. Thank you so much, Susanna, for joining us, for your commitment to excellence in all you do, and for telling this particular story. Enjoy the rest of your blog tour!